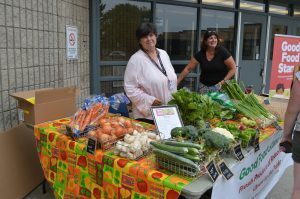 Food Stand Coordinator, Kathy Sturmey, at the Good Food Stand at Bayridge Secondary School this past fall. 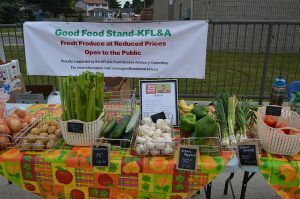 If you are looking for healthy, more affordable produce in the Kingston, Frontenac, Lennox and Addington area, you may want to visit a Good Food Stand. Since August 2018, these stands have been popping up monthly at local high schools and welcoming community members to come check them out. The stands are part of a 12-month pilot project taken on as part of the community’s Poverty Reduction Initiative. Together, United Way of KFL&A and the City of Kingston came together to co-chair a Food Advisory Committee and the committee has worked diligently to develop strategies, like the Good Food Stand, to address food access. The Good Food Stand pilot is a collaborative effort with many organizations across the region including partners from Kingston Community Health Centres, the Ontario Secondary School Teacher’s Federation, and KFL&A Public Health who have come together to co-develop and launch the initiative. The pilot also includes Tony Deodato & Sons who are supplying the fresh produce for the stands. The Community Foundation of Kingston & Area, City of Kingston and United Way provide funding for the stand coordinator position and program delivery through Kingston Community Health Centres, while KFL&A Public Health provides marketing and evaluation support with both school boards and union members supporting the venues. Other local agencies and coalition partners provide their expertise and advice on running the program. Kathy Sturmey is the Food Stand Coordinator and operates the stands each month. Sturmey has worked with the Community Harvest Market in Kingston for the past 10 years and she was excited to take on this new initiative. The stands currently operate one day a month at Regiopolis-Notre Dame Catholic High School, Sydenham High School, Napanee District Secondary School, La Salle Secondary School and Bayridge Secondary School. The main focus for the stands now is creating awareness and getting people to come out each month. Feedback from those who have frequented the stands has been positive and Sturmey has seen repeat customers as well. 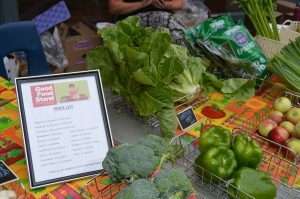 The stands also provide recipes to help individuals with their meals as well as vouchers to help those that still struggle with the price point of fresh produce. For their part, the City of Kingston is pleased to see the stands doing well and serving the community. Hitchen hopes that the stands can keep growing and filling gaps for years to come.